Everyone likes a good scare every now and then. Okay, not everyone, but most of us. Maybe we live for the rush of adrenaline, or perhaps we’re simply down for any opportunity to snuggle a little closer to a loved one. Or it could be that a terrifically frightful story can help us more confidently face the all-too-real monsters in our own lives. Goblins and ghosts and ghoulish characters of all sorts have been otherworldly sources of inspiration for many a composer. 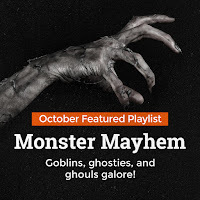 With Halloween descending swiftly upon us, it’s the perfect time to creep into the darkened, cobwebby corners of the repertoire and enjoy some musical Monster Mayhem! 1. Florence Beatrice Price – Goblin and the Mosquito – Price became the first African-American woman to be acknowledged as a symphonic composer, and to have music performed by a major orchestra. She composed piano music as well, including this delightful little depiction of a goblin (and a mosquito that buzzes impudently about its head). 2. Niels Marthinsen – Monster Symphony: I. Monsters’ Mating Call – You probably don’t want to be standing in the way when these monsters go a-courtin’. Danish composer Niels Marthinsen’s colorful first symphony is a riotous affair that showcases the skills nurtured during eight years at the Royal Academy of Music, Aarhus, under the tutelage of Per Nørgård. 3. Sergey Prokofiev – Scythian Suite: II. The Enemy God and Dance of the Spirits of Darkness – Prokofiev’s Scythian Suite was taken from his unfinished ballet Ala and Lolly. An important performance of it had to be canceled, as World War I made it impossible for enough qualified players to be found, but that didn’t prevent a damaging review from an influential critic. The piece thus had to find its audience overseas. 4. Dmitri Shostakovich – Hamlet Suite: The Ghost – Prominent Shakespeare experts Sir John Gielgud and Kenneth Branagh have declared the definitive film version of Hamlet to be a Russian production from 1964 that featured a score by Shostakovich, who had to find much of his musical expression in film work, an outlet that suffered from slightly less censorship under the Zhdanov Doctrine. 5. Anthony DiLorenzo – Dracula, Act 1: Waltz of the Dead – Dracula seems like a good subject for a ballet, right? Pointy toes, pointy teeth… Anthony DiLorenzo composed this work for his brass ensemble, Proteus 7, which for this work is augmented by a percussionist, a pair of woodwinds, theremin, daxophone (not a typo), and waterphone. 6. Jean-Philippe Rameau – Dardanus, Act IV Scene 4: Dread monster, fearsome monster – Rameau’s opera tells a story about Greek mythological hero Dardanus, who, in Rameau’s tale, is at war with King Teucer, though he is in love with Teucer’s daughter Iphise. When a great monster ravages Teucer’s kingdom, Dardanus defeats it, earning peace with Teucer and marriage with Iphise. 7. Ludwig van Beethoven – Piano Trio in D Major, Op. 70, No. 1, “Ghost”: II. Largo assai ed espressivo – One of his best-known piano trios, Beethoven’s D Major Trio earned its “Ghost” moniker thanks to the surprisingly eerie second movement. The tone makes some sense if one considers it may have been drawn from sketches of a Macbeth opera he was considering at the time. 8. Antonio Bazzini – Le Ronde des Lutins (Round of the Goblins) – Antonio Bazzini was an incredibly accomplished violinist who followed in the footsteps of Paganini. His tremendously difficult Round of the Goblins is considered a major achievement for the top level of violinists even today, with its proliferation of speedy double stops, left-hand pizzicato, and double-stopped artificial harmonics. 9. Tan Dun – Ghost Opera: V. Song of Paper – Tan Dun’s Ghost Opera was composed for the Kronos Quartet and pipa virtuoso Wu Man, but its eerie score calls for the musicians to double on everything from bowed gongs to Tibetan bells to one-stringed lutes, along with incorporating vocalizations of all sorts. The work also utilizes water, metal, stone, and paper for percussive effects. 10. Henry Cowell – The Banshee – Henry Cowell was an early proponent of extended techniques for the piano, including unconventional use of the strings and massive tone clusters that sometimes required the forearms to play. The son of a sickly single mother, he left school after the third grade to work, but his prodigious musical and intellectual gifts got him into Stanford and UC Berkeley at 17, despite barely being able to read. 11. Jerry Goldsmith – Poltergeist: Night of the Beast – Jerry Goldsmith was a highly accomplished film composer, his credits including classics like Logan’s Run, Planet of the Apes, Air Force One, Alien, Poltergeist, The Secret of NIMH, Hoosiers, and multiple Rambo and Star Trek films. Despite being nominated for numerous awards, including 18 Academy Awards nominations, he won only one, an Oscar for The Omen in 1976. 12. Benjamin Frankel – Curse of the Werewolf: XII. Finale – British composer Benjamin Frankel built up a notable oeuvre that included string quartets, symphonies, and concertos. He also paid the bills by composing the scores to over a hundred films. His score for Curse of the Werewolf includes the first serial music to feature in a British film, and later in life he developed his own 12-tone system of composition that remained relatively tonal. 13. Roy Webb – I Walked With A Zombie: End Title – Roy Webb enjoyed a prolific career as a Hollywood composer, with much of his reputation resting in his contributions to suspense and horror films such as Cat People and The Body Snatchers. He composed hundreds of scores, and his work was remarkable enough to earn seven Academy Awards nominations. 14. Hans J. Salter – The Ghost of Frankenstein: Freeing the Monster – Like Roy Webb, Hans J. Salter was a celebrated and Oscar-nominated Hollywood composer of the mid-twentieth century who specialized in work for horror and suspense films, including The Wolf Man and Creature from the Black Lagoon. He also composed a lot of stock music for Universal Studios, so much of what he did was uncredited. 15. Takayuki Hattori – Godzilla Versus Space Godzilla: Main Title – Takayuki Hattori is a third-generation composer with a long list of credits in Japan. His musical focus is film, anime, and video games, and he has been nominated for a number of awards, winning three times the Japan Academy Prize for music (Japan’s equivalent to the Oscars). 16. Moritz Eggert – The Son of the Daughter of Dracula Versus the Incredible Frankenstein – Moritz Eggert is a German composer who has a prominent place in his country’s art music scene. He has composed in many classical genres, including opera, ballet, vocal and chamber music, and solo piano. 17. Jon Brion – ParaNorman: Zombies Attack – Jon Brion began his career as a member of various rock bands, but he has found a place as a composer for film. His credits include Boogie Nights, ParaNorman, Magnolia, I <3 Huckabees, Punch-Drunk Love, and Eternal Sunshine of the Spotless Mind. He has also produced albums for artists like Rufus Wainwright, Fiona Apple, Of Montreal, and Punch Brothers. 18. Jan Erik Mikalsen – Ghouls and Moons: III. --- – Jan Erik Mikalsen is a composer from Norway who has been commissioned by major orchestras across his native country. He also enjoys incorporating in his compositions uncommon instruments such as the musical saw (a Norwegian folk instrument he plays himself), the ondes Martenot, and analog synthesizers. 19. Thea Musgrave – Turbulent Landscapes: I. Sunrise with Sea Monsters – Born in 1928 in Scotland, composer Thea Musgrave now calls the United States home. Her teachers have included Nadia Boulanger and Aaron Copland. Her oeuvre includes several historical operas, with subjects including Mary Queen of Scots, Simón Bolívar, and Harriet Tubman. Turbulent Landscapes is based upon paintings by J.M.W. Turner. 20. Jerome Kern – De Goblin’s Glide – For a lighthearted conclusion to our playlist, we’ve selected this fun tune by Jerome Kern, one of the most important American theater composers of the early 20th century. His hits include “Ol’ Man River”, “Smoke Gets in Your Eyes”, and “All the Things You Are”, along with the musical Show Boat.